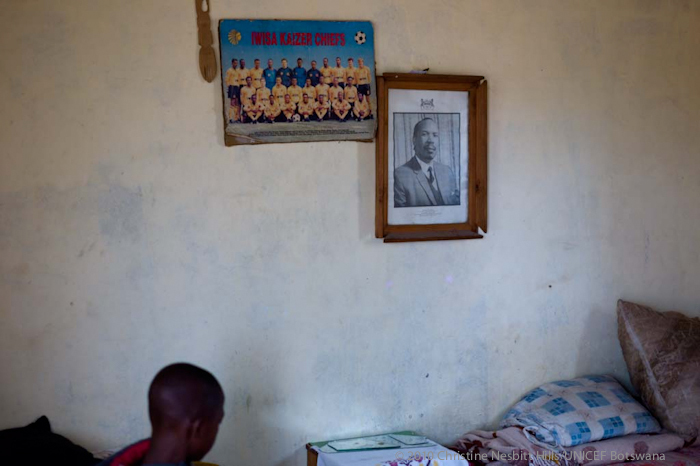 During my time working as a photographer in sub-Saharan Africa, a recurring theme has been the documentation of HIV/AIDS. Initially much of this work told the stories of the virus’ devastation in communities and it’s effects on their societies. Many of these stories told of the challenges of accepting one’s HIV-positive status and the implications of denial. In Lusaka, the capital of Zambia, the Chelstone Clinic provides vital programmes to treat HIV-positive pregnant women and to prevent mother-to-child transmission of HIV (PMTCT). HIV-positive infants diagnosed and treated within the first 12 weeks of life are 75% less likely to die. However, many infants do not receive PMTCT services because their caretakers lack access to properly equipped facilities or fear the stigma associated with HIV. For PMTCT measures to be effective, infants must adhere to a long-term, structured course of tests and services, difficult for many caretakers. This essay tells the story of Tasila Lungu and her son, Felix, through the first 18 months of his life until his HIV status is confirmed. 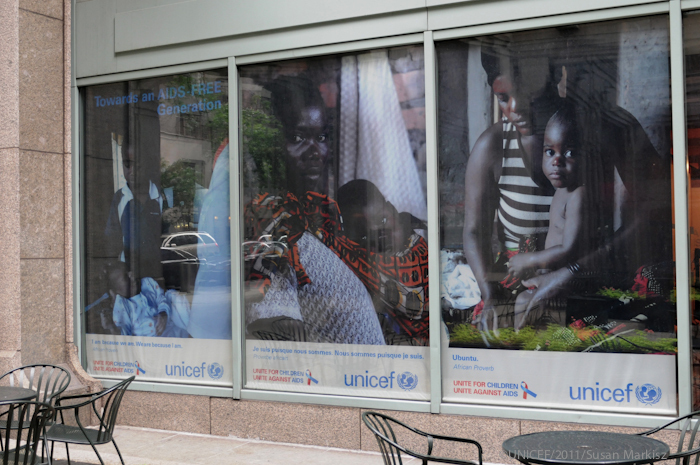 ￼In 2009, UNICEF commissioned South African photographer Christine Nesbitt to document Zambia’s services to eliminate new HIV infections in infants, as experienced by several women living with HIV and their children. From 2009-2011, Christine followed these women from pregnancy through the first 18 months of their babies’ lives, including their participation in UNICEF-supported prevention of mother-to-child transmission programmes. Botswana — Edwin Manda has headed his household, looking after his two brothers, Thato Manda and Thapelo Manda, since he was 19 years old. The Manda brothers lost their mother in 2006 after a stroke and subsequent illness, and their father in 1998. 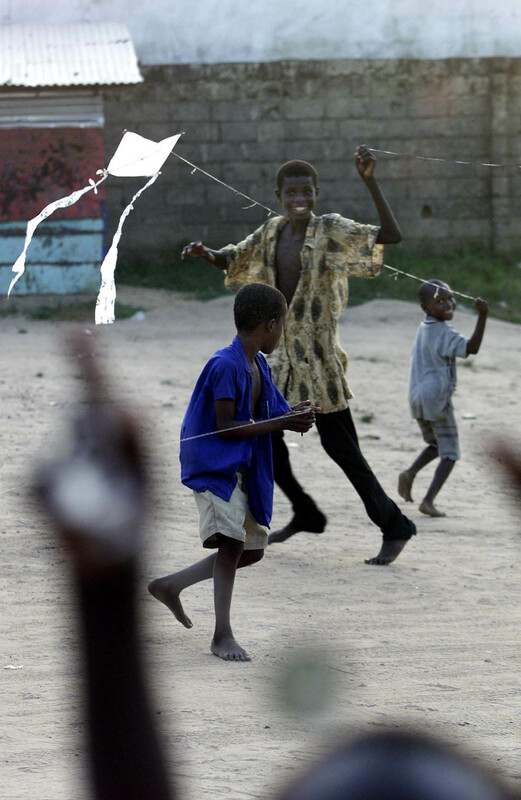 (Above) [NAME CHANGED] Marie, a 14-year-old girl, looks out the window of an interim care centre run by the NGO Samaritan’s Purse International Relief, near Monrovia, the capital in January 2004. Marie was separated from her mother almost a year ago during an attack on her village in north-eastern Liberia. In the resulting confusion, she and four other girls joined one of the fighting groups, where they underwent military training and were issued weapons. After leaving this centre, she hopes to finish school and become a doctor. Taped to the window beside Marie is a poster opposing domestic abuse of women. UNICEF-assisted interim care centres provide children who have been associated with warring factions with counseling and basic educational and skills training to help them reintegrate into civil society. A social worker comforts a 12-year-old refugee girl from neighbouring Sierra Leone, Miata [NAME CHANGED], in an interim care centre run by the NGO Samaritan’s Purse International Relief, near Monrovia, the capital of Liberia in Janaury 2004. 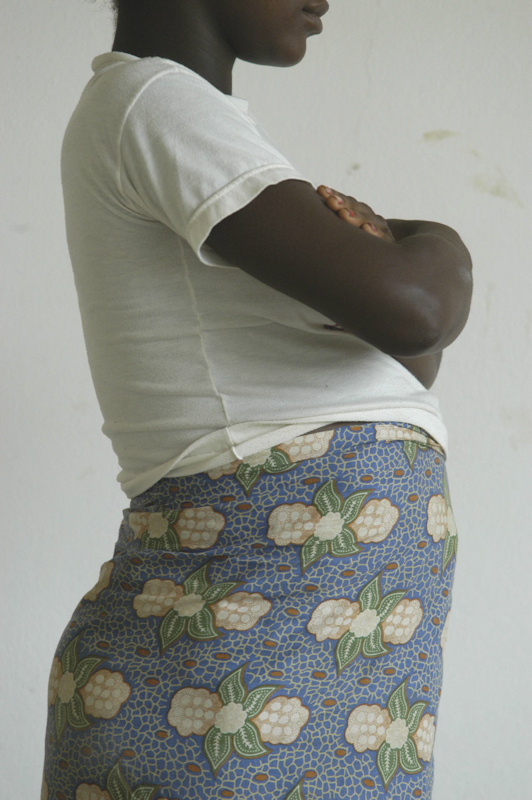 Miata came to Monrovia with her mother in July 2003, but her mother was killed one month later in a rocket explosion in the city. She did odd jobs and slept on the streets until she was brought to this centre (although she was not linked to any fighting group). Miata wants to return to her remaining family in Sierra Leone. UNICEF-assisted interim care centres provide children who have been associated with warring factions with counseling and basic educational and skills training to help them reintegrate into civil society. 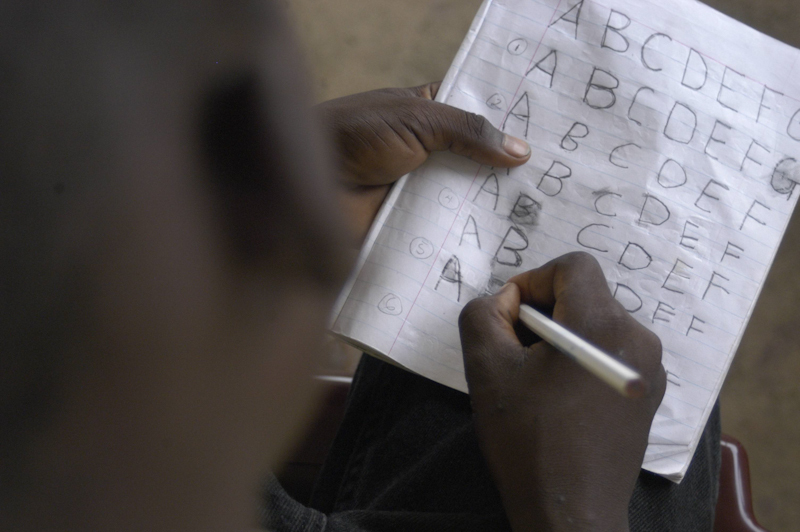 A boy practises writing the capital letters A to G in an exercise book, at a UNICEF-assisted interim care centre run by the international NGO Save the Children-United Kingdom, in Monrovia, the capital of Liberia in January 2004. Formerly a child soldier, the 11-year-old boy, who is from the north-eastern part of the country, was recruited into one of the fighting forces by his peers. He has not seen his family in four years but wants to return to them and to school. He says the first thing that he will do when he returns home is ìrun to my mother. UNICEF-assisted interim care centres provide children who have been associated with warring factions with counseling and basic educational and skills training to help them reintegrate into civil society. [NAME CHANGED] Julia, a 16-year-old girl, stands in an interim care centre run by the NGO Samaritan’s Purse International Relief, near Monrovia, the capital. Julia is from a village in the eastern part of the country. During the recent fighting, she joined one of the warring groups after being caught in attacks near her village. Her uncle was a soldier in that faction. With nowhere else to turn for protection, Julia began to cook for the soldiers and became the girlfriend of one of them. She is now five months pregnant. UNICEF-assisted interim care centres provide children who have been associated with warring factions with counseling and basic educational and skills training to help them reintegrate into civil society.